This is my Pumaman page, It might take a bit to load as the theme song is here. There is the best clip in the movie in Real Media also at the bottom of the pics. I figgered this needed to be on the internet somewhere as I searched and all I could find was a couple of reviews. These were far from good reviews but they were reviews just the same. I would say that it was a BAD MOVIE. I will agree with the reveiews but i will also add: Even the tailoring is bad!!!! "THE PUMA MAN" (1980)-Color-Mike's introduction is interrupted by a semi-macho Servo, who has a lift in his hover skirt and is suffering from "Short Man's Disease." Pearl, on the other hand, is planning a grand ball in the castle, but no one shows up. People, including Ortega (Paul Chapin) and his friends, do come to visit The Observer (Bill Corbett), though. Below sewer-level movie, directed by Alberto De Martino and starring once-decent thespian, Donald Pleasence ("Fantastic Journey," "Halloween," "The Changing Of The Guard" installment of "The Twilight Zone") as the villain, and non-talents Walter George Alton (a person not worthy of one name, let alone THREE), Miguelangel (no relation) Fuentes and Sydne Rome. Minuscule plot has Alton as paleontologist Tony Farm who finds an ancient Aztec mask, and thanks to a huge, square-headed mongoloid (Fuentes, with a Moe Howard haircut), who keeps following him, he reluctantly becomes Puma Man, one of the lamest super heroes since William Katt. Pleasence makes his second MST3K bad guy appearance (see "Warrior Of The Lost World," made that same year) and is just as lisping an inept as he was in Season Five. Needless to say, he and his moronic henchmen are out to retrieve said mask because it has the power to make people fly at odd angles and rip through cardboard sets. To say that this film is bad would be an insult to the term. Horrible, beyond ludicrous "special" effects, insipid acting, unbelievably stupid dialogue and cheesy 1970's TV soundtrack music make the entire enterprise hilarious on its own, without Mike & Co. firing verbal darts at it. And Alton's turn as the lead consists of an hour of wooden sleepwalking followed by an idiotic ten-second outburst. Ultimately, however, it's the block-headed Aztec who turns out to be the hero, and the concluding "battle" is the silliest since the end of "Santa Claus Conquers The Martians," all set to the tune of a bouncy commercial jingle making us all agree with Crow that a "call to Ted Nugent Man" was in order. Despite total absurdity of movie, the gangs gets off some classic riffs, such as "It's S & M day at the field museum,"; "I hate when Aztecs force themselves into hotel rooms and make you try on belts"; "Don't lose your footing-uh, I mean FLYING POWER"; "Help! I'm falling at a 60 degree angle breaking all the laws of physics"; "Puma Man can rip through pure contact paper"; and "Constantly Out-Of-His-League Man." Thanks to these and decent skits (Mike gets a new hairstyle-a desert; he's chosen as Colossamundy Man; and the 'bots make a replica of the head of British songster, Roger Whitaker, "The Last Farewell," but it looks more like a cross between Leonard Maltin and Kevin Murphy). This helps, however, when Murphy shows up at the end, as Whitaker, to attend Pearl's party. Nice show, plenty of laughs an a solid "B" from this humble scribbler. This one was a laugh riot. Almost unwatchable movie, with some of the corniest music this side of anything - horrible synth-disco crap. 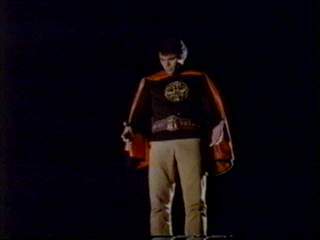 The film was obviously a bad attempt to catch onto the Greatest American Hero phenomenon, and it shows. The film is horribly idiotic, featuring Stonehedge chains, corny flying effects, and the weirdest treatment I've ever seen of suicide in a film. 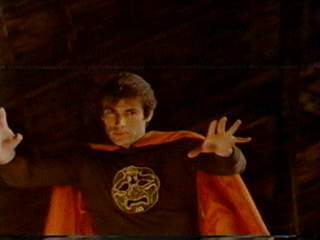 PUMA MAN, THE (TURKEY) [HORROR] Humorless Italian junk about a man given extraordinary powers to fight evil. 80m. 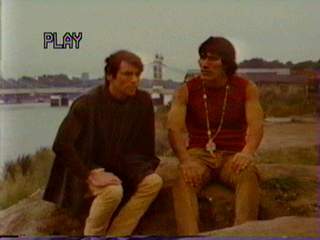 DIR: Alberto de Martino. 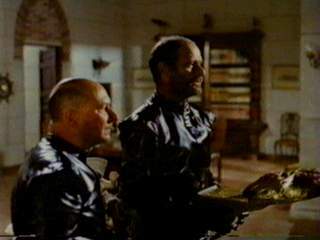 CAST: Donald Pleasence, Sydne Rome. 1980. This is The Pumaman in flight. Notice the hand are out like claws. Pretty weenie looking isn't he? I might as well add some more ramblings here because they kinda fit in here. I work with a guy named Tony (Pumaman's real name) and he has also seen the movie. Now he has to put up with me yelling to him all the time "Tony.. You have power in your hands! Your hands are like claws!" I think he likes it when I do that. This is the heroic pair. This is after Tony learns his hands are claws and is getting into the life as Pumaman. He is starting to dig the groovy powers that have been bestowed upon him. I still think that I would look good dressed in a cape like that. This is the evil Dr Kobras and his daskardly buddy. I don't think they ever give his name. I just call him the henchman. Its the evil Dr Kobras that is the real bad apple of the crew. He is the one that plans to take over the world. Can Pumaman save the world? I think we all know the answer to that one.